In addition, you’ll find some general info relevant for anywhere. That includes info about benefits of biking to school, Safe Routes to School info about forming a bike train (find that under the “Stop” notes), and toward the end of this post, more SRTS info. College students: Monterey County college students, click here. Above: Salinas youth making use of East Market Street’s new buffered bike lanes, part of East Market Street infrastructure improvements in 2017. Below: An elder leads the way for this girl making use of Seaside and Monterey’s Class I sections of the Monterey Bay Sanctuary Scenic Trail network. Above: Kammann School, Salinas, May 2014. Photo courtesy of Salinas City Elementary Educational Foundation. Even if your route to school isn’t ideal, consider a bike-and-ride or bike-and-walk option. Any mile of active transportation beats a mile of driving, and most children and teens find it’s more fun getting to school on two wheels, even partway. “What’s lost when kids don’t bike to school?” David Darlington responded to that question on National Public Radio, May 2, 2012. Hear the 16-minute audio or read the transcript at NPR.org. Schools providing bike-friendly resources are doing a lot to build students’ health–including preventing obesity and diabetes (as North Monterey County and South Santa Cruz County teen advocates for physical activity know), and much more. When Dr. Hugh Stallworth retired from the Monterey County Health Department after a 42-year career in the field, he told the Monterey County Weekly’s Sara Rubin (http://www.montereycountyweekly.com/blogs/news_blog/retiring-county-public-health-leader-reflects-on-h-n-childhood/article_97930e7a-032f-53cb-95a6-f2a6ff828935.html) that the most challenging public health issue here is one shared by the nation: childhood obesity. He warned that changing this is going “to have to be an entire community effort. If we don’t solve that one, the prediction is this is the first generation where parents might outlive their kids. That’s one of my greatest concerns.” Biking can help! Susan Ragsdale-Cronin agrees. This avid bike commuter mom (pictured below with her daughters) advocates for better bicycle infrastructure–including by serving on the Transportation Agency’s bike/ped advisory committee. Why? Because she and her family experience firsthand the multiple benefits of biking! This Del Rey Oaks bike commuter mom bikes her daughters to school on a regular basis, from their DRO home to San Carlos School in downtown Monterey. Photo provided courtesy of Susan Ragsdale-Cronin. Report specific items needing prompt attention; use TAMC’s online Bicycle Facilities Service Request form online (or fax, postal mail, or hand deliver print version) to report bikeway (or pedestrian access) conditions, including: potholes, debris on shoulders or bikeways, bikeways not clearly marked, damaged or missing bikeway signs, traffic signal not triggered by bicycles (no bike detection), vegetation overgrowth, construction obstacles, and other conditions interfering with safe and efficient travel by bike (or by foot). Request free equipment: free bike racks, lockers, repair/maintenance stations, or skateboard racks from TAMC. A three-year “Bicycle Secure Program” was launched for 2015-2017. See http://www.tamcmonterey.org/programs/bike-pedestrian/bicycle-secure-program/ for the latest details, including application deadlines. Check out the School Zone improvements planned for Salinas, as reported by Roberto Robledo in the Californian in “School crosswalks: Unfinished business” 8/19/16. Infrastucture improvements can seem a long time coming. We celebrate when those dreams come to fruition, e.g., on East Market Street, Salinas, where I met the youth above—making good use of the new Class IV lanes—on October 15, 2017. Before biking to school—or anywhere—learn riding skills, safety tips, and bike laws! Start by reviewing “Be Cool, Be Safe – Bike Law Summary and Resources.” In Spanish: Leyes de ciclismo de CA – Laws for bicyclists in CA (Spanish, English) – Summary. Listen to a 90-second audio about sidewalk riding, and learn much more about that topic in “Bicycling on Sidewalks: Misconceptions and Advisories. Also: Crosswalks, and “What Pedestrians and Bicyclists Want Each Other to Know.” That sidewalk post includes links to local ordinances about sidewalk riding in Monterey County. January 2018 update: See Safe Routes to School — Monterey County 2018 update. BIKE TRAINS: You may to consider forming, with other adults, bicycle trains to serve students who are upper elementary school age and older. The suggested ratio of adult supervisors is one adult for every three to six children. Learn more on the Safe Routes to School website: http://guide.saferoutesinfo.org/walking_school_bus/bicycle_trains.cfm. Before starting the operation of your bike train, it’s highly recommended to provide riders with practice and training on bicycle handling and rules of the road. One way to help them learn riding skills, safety, and rules of the road / bike laws, including about sidewalk riding, is to arrange trainings with a cycling instructor. Monterey County has some League of American Bicyclists certified instructors (LCIs), such as Frank Henderson, Geoff Arnold, and others. Find them in section 9b of Bicycling Monterey’s directory of Monterey County bicycling resources. Click here for examples of how Monterey County law enforcement is backing up children and teens in biking safely. Are you a high schooler who wants to be on a bike team, but you’re unable to purchase a bike? Or, do you have kids of any age who want to bike commute or bike-and-ride to school, but the family budget doesn’t allow purchasing a bike and the recommended or required equipment? Gears4Good.org is a local nonprofit that may be able to help. Click here to learn more about Gears 4 Good and others helping. Fostering Student Success by Preventing Brain Injury: A School Policy Manual for Safe Bicycle Riding is available online from the California Department of Public Health. The document goes beyond its primary focus of helmet use. Your school’s administrators, site council, PTA, etc. may want to look it over for ideas to help make yours a bike-friendly school environment. Go to your school’s leaders and see how you can work together to support more and safer bicycling. Feel free to phone me to discuss ideas. For 2015-2017, the Transportation Agency for Monterey County is offering free bike maintenance/repair stations as well as free bike racks, bike lockers, and skateboard racks. Click here to learn more. See http://www.tamcmonterey.org/programs/bike-pedestrian/bicycle-secure-program/ for the latest details, including application deadlines. Did you know that Salinas High School has gone from empty bicycle racks to packed-full racks, with overflow bikes locked to fencing? In August 2012, SHS added a student bicycle maintenance station. That’s right! The bike maintenance/repair stand and tools are available to any student, courtesy of the SHS mountain biking team. See that MTB team–and bike buzz from other Monterey County elementary, middle, and high schools–below. Wonder if the SHS bike maintenance station gets much use? You bet! After the school day ended that very first week, eight or more students quickly gathered to work on their bikes. Click here and see for yourself! Salinas High students need not worry if they get to school and realize their brakes are in dire need of adjusting. No need to fit in an urgent stop at a bike shop before heading to an after-school job, sports practice, homework session, or other destination. Instead, students can stop by the SHS bike maintenance station and do it themselves. Need a little air in your tires? On the SHS campus, you’ll find this convenient maintenance station outside Mr. Warwick’s classroom, or rolling around campus. Questions? Contact Jim Warwick, 831-262-4152. Maybe you’re an SHS student and thinking “Great, but I don’t know what to do with those tools.” Here’s one solution: There are basic bike maintenance classes offered by City of Monterey Parks and Rec for children, teens, and adults; click here. Notice all the buzz around the nation is “bike to school,” not “bike at school”? After you’ve arrived inside the SHS schoolyard, please walk your bike. This is the campus rule for some other Monterey County schools too, depending on the campus layout. Unsure? Check with the school administration, or contact me. TAMC’s help is a wonderful option for local schools needing more bike parking, including the Big Sur Charter School‘s Monterey program site (below). Besides Salinas High School, what other support is there at schools in Monterey County for students who ride a bike? Below are a variety of examples. When Ron Dillender moved from Monterey Park to Lincoln Elementary School, another Salinas City Elementary School, he started a cycling club there too. As of 2015-16 school year, Ron is now a Principal on Special Assignment for the district (no longer at Lincoln). Contact the Lincoln Elementary school office to see if that club is continuing. If you have questions for Ron Dillender about starting an elementary school cycling club, contact Ron at the Salinas City Elementary School district office. When Principal Ron Dillender came to Monterey County to serve at Monterey Park Elementary School, a K-6 Salinas City Elementary School, he had been an avid supporter of kids biking for many years. At his previous school, Mr. Dillender had teamed up with another administrator to create a bike club. Why? They knew that a bike club could help students become more active and motivated. Mr. Dillender wanted to help his Salinas students bike too. At Monterey Park, another dedicated educator and cyclist, Cliff Siegel, supported this vision by giving a great deal of time, expertise, and dedication to make Monterey Park Cycling successful. Monterey Park Elementary School students don’t just bike on rides with their cycling club. Among those who also bike to school is a kindergartner who rides, accompanied by her parents, the 3/4 mile back and forth to school every day. In the 2012-13 school year, this kindergarten student missed biking-to-school only five times. Kudos to Monterey Park for inspiring and supporting more kids in this healthy habit. Some Monterey Park School students and their parents were among the people of all ages who came to the 2013 Intergenerational Ride celebrating Bike Week. It is thanks to those students–who were wearing their bright green “Monterey Park Cycling” t-shirts–that Bicycling Monterey learned about their school’s bike club! Click here so you can learn more about Monterey Park Cycling too. Pacific Grove Middle School teacher Dessa Murphy is happy that many PG middle schoolers are biking to school. This physical education teacher knows the many benefits of biking, and she’s an avid cyclist herself! Photo below provided courtesy of Dessa Murphy. Many schools around the country have a “bike cage” that is locked by personnel at beginning and end of the day. Although PG Middle’s handbook encourages personal bike locks inside the cage anyway, schools nationwide recognize that making a locked “bike cage” available has the advantage of accommodating kids whose families cannot afford bicycle locks. PG High senior Hugh Hudson made it his Eagle Scout project to create attractive as well as functional bicycle parking on the PG High campus. See “Pacific Grove student refurbishes high school bike racks as Eagle Scout project” by Vernon McKnight and Carly Mayberry in the Monterey County Herald, 5/25/16. Mountain Bike Mondays, for middle schoolers (and for 4th and 5th graders with parents present). Refer to page 5 of the March 2016 issue of “The Oak Leaf,” the San Benancio Middle School newsletter, or contact Gretta Williams, (831) 214-0978 / ganddwilliams@razzolink.com or the school for any updates or changes. Although you’ll see faculty and staff biking, and there are bike racks on campus, few students bike to Santa Catalina. But the teen below knows that bicycling need not be all or nothing! She knows bike-and-ride is an option, such as Monterey-Salinas Transit or a parent’s vehicle. She enjoys the fun and convenience that a bicycle gives her. And having her bicycle at school means when Dad is her bike-and-ride option, he just might be ready for a dad-and-daughter after-school ride too. What a great way to burn off school-day stress before launching into the evening’s homework! Check with Santa Catalina School for any updates to school policies. The 2017-2018 Lower and Middle School Family Handbook states that students must have written parental permission on file in the school office if they ride bicycles to school. The handbook also states: students may not ride their bicycles on campus; riders are to walk their bicycles to and from Mark Thomas Drive; and roller skates, rollerblades, and skateboards may not be used on campus. Santa Rita Elementary School was the first school in Salinas to provide a “bike cage” so kids biking to school would have that easy bike security option. Tip of the helmet to Santa Rita for leading the way in Salinas! You can see another “bike cage” at La Paz Middle School in Salinas. Even on a winter morning (the photo below was taken on January 10, 2012), La Paz had students who biked to school and made use of the school’s helpful bike security measure. At Oscar Lloya Elementary School, planners likewise knew that having a “bike cage” means students can bike to school without worrying about bicycle security there. Nice! Taylor Farms partnered with Golden State Foods Foundation to donate 321 bikes to hard-working K-6 students at Bardin, presented on June 5, 2013. The “Pedal to Perfection” program rewarded students with a brand new bike, helmet, and lock for demonstrating near to perfect attendance during the school year, as well as other outstanding behavior. The program helped raise student attendance rates and helps motivate children to achieve academic success. Thanks also to a hundred Taylor Farms employees who volunteered to assemble and deliver the bikes. Here’s a big shout-out to Taylor Farms and Golden State Foods Foundation for recognizing the many benefits of bicycling, including for physical health and academic success. For the 2013-2014 school year, Taylor Farms will again reward students at another Alisal District School (not yet named) with new bikes, helmets, and locks, just as they did for Bardin in June 2013. In addition, first grade students get a different sort of boost from Taylor Farms at Alisal Community Elementary, Frank Paul Elementary, Los Padres Elementary, and Roosevelt Elementary. Every year, children entering first grade at these Alisal District Schools receive a new backpack, courtesy of Taylor Farms. And as every bicyclist knows, having a backpack can be a good solution for toting books and such while biking, so you can keep both hands free for the handlebars. Thanks, Taylor Farms! “Salinas: Monte Bella students earn bikes for perfect attendance” again in 2018, as reported by Juan Reyes in the Monterey County Herald on 6/12/18. The story reported, “Monte Bella Elementary is the only school in the Alisal Union School District that gives away bikes to each student who achieves the goal,” and this year 78 students were awarded bicycles, or the option of a scooter instead. The bikes and scooters were again funded by Alisal Rotary Club and Salinas Police Officers Association, as well as other community members. The Herald story further acknowledges “The bikes were donated by the Alisal Rotary Club and the Salinas Police Officers Association.” Salinas PD chimed in on Twitter, there was a third donor too: “El Kiosko 2 Taqueria” (HER Helmet Thursdays spot Taqueria El Kiosko). Tiburcio Vasquez Elementary School in the Alisal district, East Salinas, had 61 students who were each awarded a free bicycle and helmet on June 5, 2015. Why? Perfect attendance for the year. This boost for students’ biking was organized by Salinas Police Department Officer Danny Garcia, with help from Officer Ian Parsons, the Salinas Police Officers Association, and the California Highway Patrol. It was made possible by donations from police officers, Alisal Rotary members, and other generous people. Gracias! Students biking, walking, or skating to both of these schools are among the people who will benefit from the East Market Street Safe Routes to School Project, infrastructure improvements made possible in conjunction with Via Salinas Valley: Pathways to Health through Active Transportation. Included in the East Market Street project are some Class II and Class IV bike lanes. Learn more here. For Bike Month fun in May 2018 (photo above), Geoff Arnold, a League of American Bicyclists cycling instructor (see section 9b of the Monterey County bicycling resources directory) —along with Frank Pinto of local bicycle shop Work Horse Bicycles, and others—helped students at Bay View Academy with a bike rodeo and other activities. Bay View Academy serves children grades K-8. Among support for students are such Bike Month celebrations. For example, in 2015 it was bike to school any day May 5-8, 2015 for a chance to win prizes. Bring your bike to school on May 6, 2015 for the Bike Rodeo, even if you can’t ride it to school. Free bike fitting, free bike registration, skills course, bike games. Special thanks to the parents and other volunteers who team up with the school to make this possible. Cesar Chavez Elementary School had four Bike Smart! Youth Bicycle Safety Education (www.bikesmart.org), aka “bike rodeos” in December 2013, thanks to the Transportation Agency for Monterey County (TAMC) contracting with Ecology Action of Santa Cruz. To help make more outreach in South County possible, Bike Smart! would like to build up a base of Monterey County volunteers. Learn more. Chartwell School received a donation of 30 bicycles, helmets, and more from Specialized Bicycles as part of “a study exploring the relationship between cycling, outdoor activities, and academic performance.” See “Cycling and academics: Chartwell gets big donation with study in mind” by Brendan Bane in the Monterey County Herald. Many students of Dr. Martin Luther King, Jr. Academy walk to school, and a smaller number bike to school as well. For those bike-to-school students–plus the many students who simply bike in their neighborhoods!–Principal Kristi Burns wants to support them in biking safely. Principal Burns knows that bicycling has benefits to physical, mental, and emotional well-being, along with other benefits. She’d love to make it possible for more of her students to bike with the helmets required by CA law for minors. The principal’s wish list includes securing funds to purchase helmets that can be given to students, along with bike safety instruction. Principal Burns made that need known to Bicycling Monterey, who advised appropriate others of the need too–and they responded helpfully! In 2014, Dr. Martin Luther King, Jr. Academy was one of the sites selected by the Transportation Agency for Monterey County for Bike Smart! Safety Training. And in addition, the school was gifted 13 bicycle helmets by Little Bellas. This good start is thanks to Kristi Burns, as well as office assistant Maria Ortega, for being tuned in to students’ needs and expressing those needs. Friday, May 23 – Bike safety trainings AKA bike rodeos for three 5th grade classes at 8:20 a.m., with all three being completed by 2:40 p.m.
How did the MLK Academy students do, and what did they learn? Bike Smart’s volunteers found the MLK Academy students engaged, respectful, and ready to challenge themselves at the bicycle rodeo. The students learned how to properly fit a bicycle helmet, how to safely change lanes, the rules of the intersection and how to communicate with drivers and other cyclists, and how to handle their bikes more skillfully. Click here for a dozen more bike rodeo photos from MLK Academy, courtesy of Elise Ehrheart of Bike Smart! MLK Academy also shows it places a high priority on biking as a transportation option by the location of their bike rack: conveniently located near the school entrance. Kammann School in Salinas, serving grades K-6, had four Bike Smart! Youth Bicycle Safety Education (www.bikesmart.org), aka “bike rodeos” in May 2013, thanks to the Transportation Agency for Monterey County (TAMC) contracting with Ecology Action of Santa Cruz to put these on for some 5th grade students at Monterey County schools. Bike Smart! returned to Kammann in May 2014, with two presentations on Monday, May 12. The first, from 8:15-9:15 a.m. was to address three classes, and the second, from 9:20-10:20 a.m., two classes (both are combination classes that include fifth graders). Then on Friday, May 16, all fifth grade students at Kammann were to participate in one of the three Bike Smart! safety trainings/rodeos offered that day between 8:20 a.m. and 2:30 p.m. In 2017, Peggy Zagelow Beard, an employee of Ecology Action, was seeking Monterey County volunteers to help with more bike rodeos at Kammann, scheduled for May 24 and May 25, 2017; shifts both days: 8-10:30 am. and 10:30 a.m. – 12:30 p.m. Peggy said volunteers would be helping as 4th and 5th grade students practiced signaling, stopping, safe turns, negotiating cars, etc. Caution: Children are being taught beginning lessons about “negotiating cars.” As advised in Bicycling Monterey’s”Riding Skills, Bike Safety, and CA Bicycle Laws–for Children, Teens, and Adults,” topic 20: Most people agree that children up to approximately age 13 (some say 9-13) cannot really make the necessary decisions about vehicle speed and distance that allow them to bike safely in the street. Below is a May 2014 photo from Kammann, provided courtesy of the Salinas City Elementary Educational Foundation. La Mesa Elementary enlisted the help of a City of Monterey Police Department school resource officer, Officer Greg Galin, in teaching bike safety and putting on a bike rodeo on 8/24/17. Madonna Del Sasso School, a co-ed preschool through 8th grade Catholic school has partnered with the Monterey Bay Racing Team to teach children bike. 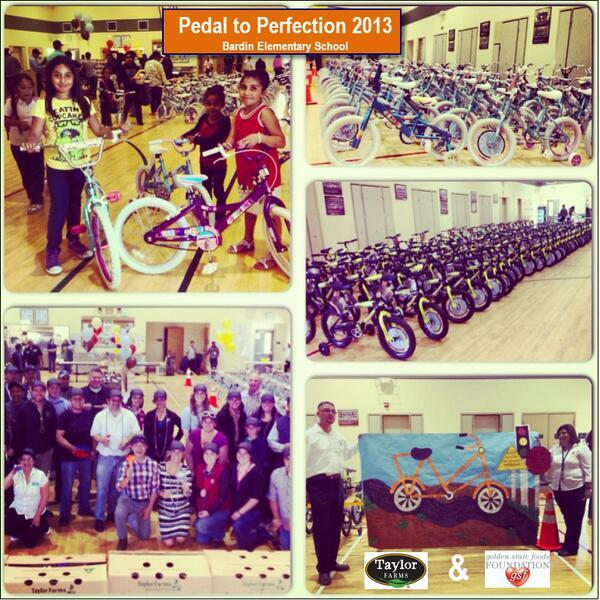 Madonna Del Sasso had a bicycle rodeo on 11/15/13, thanks to MBRT. This amateur racing team brought its volunteers who hosted the rodeo/bike clinic to teach children bike skills and precautions to help them ride a bicycle safely. Riders were checked for proper helmet and bike fit. An eight-station biking course allowed kids to learn proper mounting and dismounting of a bike, how to change direction and turn in circles, steer through tight spots, weave (appropriately! ), stop quickly, ride super slow while maintaining balance, and maneuver tight turns. Questions? Contact Don Chapin III, (831) 444-4130 or email d3@donchapin.com. May 24, 2018: Bill Ziering, age 88 and a USAT triathlon ambassador, met with 25 fifth graders at the Martin Luther King, Jr. Elementary School in Seaside (as well as with two other neighborhood schools two weeks prior). Bill led an interactive discussion about the merits and joy of bike riding (as well as swimming and jogging/hiking). February 7, 2014: Bicycling Monterey founder Mari Lynch made a presentation at the Safe Routes to School meeting on bicycling laws, riding skills, and available resources. The #1 concern of parents and educators at this meeting was parents and others driving too fast in the pick-up zones and parking lots! Read about the Salinas High Cowboys Racing Mountain Bike Team on this site. Don’t have a bike and want to be on the SHS team? Or, have a bike to donate to an SHS student who’d like to be on the team? Click here. Homeschool, unschool, public school, private school, or independent study: If you are a high-school-age student from anywhere in Monterey County, you are welcome to be on the Monterey Composite team. No tryouts, and all ability levels welcome. Read about Monterey Composite High School Mountain Bike Team on this site. “Sharing the gift of cycling: Ord Terrace first graders get new bicycles,” by Juan Reyes in the 4/18/18 Monterey County Herald. Palma School, an all-boys Catholic college prep high school in the Salinas Valley, has started a mountain bike team as of January 2013. Initial contacts are Mr. George Garibay (422-6391) or Mr. John Pattullo (970-6537). Click here. Contact Rancho Cielo to see what biking activities they may have at present, and to learn how you can support any current efforts there. Here’s some history: Some years Ranch youth have competed at Sea Otter Classic under the guidance of a longtime (now former) employee Luciano Rodriguez. (Click here for Luciano’s related letter to the Californian‘s “We Could Car Less” column, 10/5/14.) Rancho Cielo youth have had the opportunity to fulfill their physical education credits by training for and racing at Sea Otter. (Luciano has raced there for 15 consecutive years as of April 2017.) The first Rancho Cielo student followed Luciano’s lead by racing SOC in April 2012, and in April 2013, there were five RC students racing in this world-renowned event. Rancho Cielo students can also gain inspiration about biking by taking a field trip to Sea Otter, which is not only renowned worldwide for bike racing but is also a bicycle festival and features North America’s largest bike expo. Stevenson School (formerly Robert Louis Stevenson School/RLS) points out to their high school students that biking is a great way to experience the natural beauty of the Monterey Peninsula. Stevenson highlights local biking resources in their website’s Student Life section for the Pebble Beach campus (grades 9-12), under suggested Weekend Activities. Clearly Stevenson School leaders recognize how biking benefits youth, and they want their students to experience the many benefits of bicycling. This Pacific Grove public school usually has an annual bicycle rodeo, thanks to parent/teacher volunteers from the Robert Down PTA. For 2012, it was scheduled for Sat, 8/25, from 9:30 – 11:30 a.m. For 2017, Sat, 9/9, from 10 a.m. – noon. The Robert Down bike rodeo is supported by other volunteers too, including Winning Wheels Bicycle Shop (831-375-4322), 318 Grand Avenue, Pacific Grove. Basic bicycle safety checks with minor repairs are part of the mix. If you have bike maintenance skills, call Hector Chavez at Winning Wheels and volunteer to help keep kids’ bikes in safe running condition. As part of the rodeo activities, some participants will go home with a new bicycle helmet; e.g., on 9/9/17, six kids will get new bike helmets donated by the Pacific Grove Police Officers’ Association. Students who bike, walk, skateboard, or skate to North County High benefit from improved infrastructure in the school’s vicinity, the Castroville Bicycle and Pedestrian Overcrossing. Chalone Peaks P.E. teacher and volunteer organizer Dave Sarbeck got about 100 of his students to go down to the Amgen Tour of California Stage 3 Start in King City on May 15, 2018. Also in King City at the Stage 3 Start, Transportation Agency for Monterey County partnered with the Monterey County Health Department to provide free activities for kids to help them learn about safer biking and walking. Click here to read an Aug 2012 report on Safe Routes to School in our South County cities of King City and Soledad. Ride America for Safe Routes visitors were in Monterey County in April 2012. They made a presentation at Jack Franscioni Elementary School in Soledad, then did the bike-and-ride to Monterey, where they camped at Veterans Park. Click here for photos from their visit on this site. See “Safe Routes to School” contacts for Monterey County in Section 19 of the Bicycling Monterey’s Main Resources / Bike Community Leaders page. Be aware that these leaders are working hard to accomplish a variety of job responsibilities during times of austere budgets. Ask what you can do to help! Some teen boys, from all over Monterey County, are in the care of the Monterey County Probation Department Youth Center, Salinas. Their primary instruction is provided by the Monterey County Office of Education. In addition, they have a variety of enrichment classes. Among these classes is a popular bicycle repair and safety class–the first high school bike tech class in Monterey County!–which reached its second anniversary in April 2014. The class is offered to a small number of students at this time, but more volunteer instructors could increase those numbers. Click here to learn about the Monterey County Youth Center bike class, and how you can support its longevity and expansion! League of American Bicyclists local instructor Frank Henderson is available to come to Monterey County and Monterey Bay region schools and events. North Monterey County teens are among a group of teens working to build healthier lifestyles for youth who attended the Monterey Bay Sanctuary Scenic Trail network meeting in Watsonville; read the post and learn why. To my knowledge, as of 11/23/13–and according to some Castroville librarians–more Castroville kids skateboard to school than bike! That may change, thanks in part to the new bike shop in Castroville; see Castroville tips. For more examples of effort being made to help more Monterey County children bike safely, see Seaside’s PAL Bike Fair and South County Health & Safety Fair. Children and Teens section of this site (access it above the banner anytime). Besides biking info, you’ll also find a few other youth-related resources such as Barbara Coloroso’s visit to Monterey County–Kids Are Worth it! Includes teen and Spanish/English free materials on the Bully, the Bullied, and the Bystander. If you have children or teens interested in mountain biking, take advantage of the Monterey Off Road Cycling Association / MORCA’s Take a Kid Mountain Biking Day, where they’ll receive safety instruction while having fun. MORCA has regularly scheduled rides for a variety of abilities. Their activities are included on Bicycling Monterey’s master calendar, or to focus on MORCA activities only, refer to the MORCA calendar at MORCAmtb.org. Consider that many kids in our county can’t afford bikes; maybe you can help! San Benito County is a Monterey Bay region leader in providing Safe Routes to School info for all schools, and in both English and Spanish; check out their maps! Be inspired too by the Green Ways to School program of our Santa Cruz neighbors. Having participated in two recent Safe Routes to School webinars (Webinars 3 and 6 below), I know these resources are typically full of helpful info. Please refer to the bottom of this post for links. The Safe Routes to School National Partnership hosted a six-part webinar series in 2011 that focused on bicycling and Safe Routes to School. A special thanks to the SRAM Cycling Fund for making this series possible. Hundreds of people attended each of the webinars. A complete list of the webinars is below. Click the links below to watch a recording of the webinar and download the webinar’s tip sheet, PowerPoint slides and Q&A sheet. Bike to School Day in Monterey County means kids at participating Monterey, Salinas, Seaside, and Soledad schools will be celebrating their joy rides over free breakfasts. Since its inception in 1995, Bike to School Day has been observed in the Monterey Bay region. The U.S. Department of Transportation proclaimed May 9, 2012 the First National Bike to School Day! Congratulations to @Bike2School in Bloomington, IL and other leaders in this grassroots movement. It’s terrific to work in partnership with others around the nation to support more kids biking to school! Not sure your child’s bike is in safe working condition? Take advantage of $10 safety checks and minor tune-ups at many Monterey County bike shops in celebration of Bike Week/Bike Month. Five elementary schools were the focus of this grant: four schools in Seaside–Martin Luther King Jr. Elementary, Ord Terrace Elementary, Highland Elementary, and Del Rey Oaks Elementary; and one in Marina, Marina Vista Elementary. On 2/27/13, Susan Kent participated in a community TV presentation as reported here. Susan also indicated that among other tentative activities were Rock and Roll Days. On 2/7/14, at the invitation of Jairo Hernandez, Mari Lynch presented about Bicycling Monterey and other local bike safety resources at the Safe Routes to School Committee meeting: Feb 2014_SRTS AGENDA. There was much discussion about the need for more mindfulness by drivers in school zones. Outcomes: Based on local needs, the primary focus with this grant was pedestrian safety, including support for reducing motor vehicle speeds in school zones. This included, for example, encouraging the City of Seaside to support AB 321, which would drop speed limit in school zones from 25 mph. The five participating schools received some bicycle helmet education and were provided resource binders with info about such things as how to put on a bicycle rodeo. Here are examples of how volunteers make a difference for Monterey County school children–including some ways you can help. 1. Monterey County boys ages 14-17 are learning bike skills as part of their education and treatment at the Monterey County Youth Center. A bicycle repair and safety class was founded in 2012 by a volunteer, and as of February 2015, the class continues to be powered by volunteers. Although skilled bike mechanics are encouraged to volunteer, there are also admin and other volunteer needs requiring no bike skills at all. Read “Teach Teens Well” for details, and who to contact if you might like to volunteer. 2. For 2015, the Community Foundation for Monterey County and the Monterey Peninsula Foundation are funding Bike Smart, a program of Ecology Action of Santa Cruz, to work with more schools in Salinas, and this year, in Castroville too. Elementary schools included within the 2015 grants include Castroville Elementary School, and the following Salinas schools: Bardin, Dr. Martin Luther King, Jr. Academy, Dr. Oscar F. Loya, Kammann, Lincoln, McKinnon, Monterey Park, and Santa Rita. Historically, Ecology Action’s Bike Smart program has been in Santa Cruz County. In 2013, they began being active in Monterey County (contracted in 2013-14 by the Transportation Agency for Monterey County). For 2015, Ecology Action’s Bike Smart is again seeking local volunteers. To apply for a volunteer position, contact Kira Ticus, Program Coordinator, by email – kticus@ecoact.org – or by phone 831-515-1338. The bilingual assistant program coordinator is Nallely Ruiz: nruiz@ecoact.org. For more info, click here. Background, 2013-14: Four rodeos took place at Cesar Chavez Elementary School in Greenfield in December 2013. Four were done in May 2013 at Kammann School in Salinas; and in May 2014, Bike Smart! was at Dr. Martin Luther, Jr. Academy, Salinas (click here for a dozen photos) and again at Kammann School, Salinas. Kammann School is the location of the May 2014 photo displayed at the top of this post (thanks to Salinas City Elementary Educational Foundation for the photo). Learn more in individual school sections below. 3. Volunteers can help maximize the success of the Monterey County Health Department‘s Safe Routes to School Program under the Active Transportation Project (ATP); refer to Salinas Valley: Pathway to Health. Contact person, as of July 2015, is Jessica Perez: PerezJ7@co.monterey.ca.us (831)755-8975. The Health Department makes use of Safe Moves and other resources in its Safe Routes to School projects. Posted by: Founder, Bicycling Monterey on 29 April 2018. One or more updates last made on 6 April 2019. I love the idea of school based bicycle maintenance stations for students and have forwarded the idea to colleagues in the Santa Cruz area. Thanks for sharing!